Should I Recycle My Old Disposable Batteries? 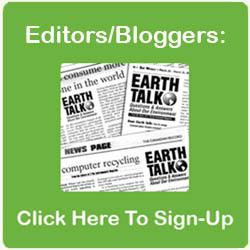 Dear EarthTalk: Can I throw my old disposable batteries in the trash or is there a way to recycle them? Truth be told, those old used up disposable alkaline batteries (AA, AAA, C, D, 9-volt, etc.) aren’t the environmental menace they used to be before the federal government mandated taking out the mercury, a potent neurotoxin linked to a wide range of environmental and health problems, as part of the Mercury-Containing and Rechargeable Battery Management Act of 1996. These days, in every U.S. state except California (which requires recycling of all spent batteries), it is safe and legal to throw them in the trash. Environmental Health & Safety Online, the leading web-based clearinghouse for information on environmental health and safety, reports that today’s alkaline disposables are composed “primarily of common metals—steel, zinc, and manganese—that do not pose a health or environmental risk during normal use or disposal. In California, tighter waste reduction laws mean that residents are required to recycle their spent alkalines by placing them in clear ziplock bags on top of their curbside trash cans (so garbage haulers can keep them separate) or by dropping them in battery recycling bins (such as in larger apartment buildings and at libraries). Many electronics, big box and drugstore chains that sell batteries (BestBuy, Walgreens and others) will also take them back for free and send them off for recycling. Check out the CalRecycle website for more detailed information on battery recycling in the Golden State. 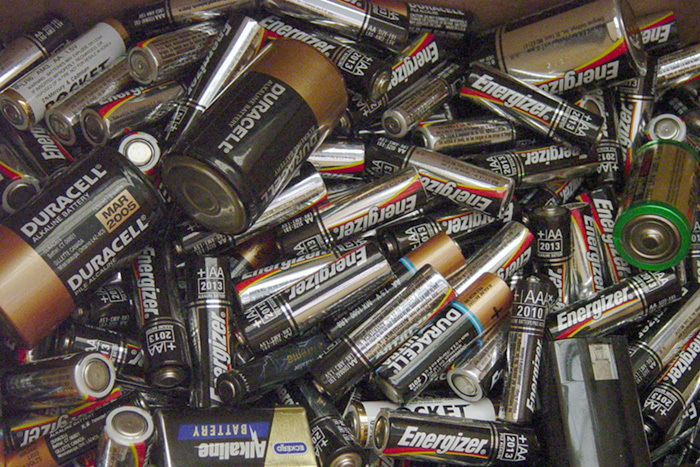 Unfortunately, some other kinds of disposable batteries, such as the increasingly ubiquitous alkaline manganese “button cells” (commonly used in digital thermometers, calculators and many toys), still contain mercury, and the federal government provides little guidance regarding their proper disposal. The Mercury-Containing and Rechargeable Battery Management Act doesn’t mandate phasing mercury out of alkaline manganese button cells because, at the time of the law’s passage in 1996, including mercury was the only way to control the potentially dangerous formation of gas inside the specialized miniature batteries. Lithium button cells are a safer, mercury-free alternative now widely available, but consumers often opt for the still cheaper alkaline manganese variety. “The use and disposal of mercury-added button cells are unregulated at the federal level,” reports the U.S. Environmental Protection Agency (EPA). “They do not have to be labeled; it is legal to dispose of them in the household trash; and they rarely are collected for recycling in most U.S. jurisdictions.” California is currently the only state that mandates recycling even for alkaline manganese button cells, but several other states are considering regulating their disposal and whether to subsidize special recycling programs for them. But until then, most of the mercury from these little wonders will end up in the municipal solid waste stream and contribute to our ongoing pollution burden. Fortunately, the recycling of most types of rechargeable batteries (which can contain potentially harmful heavy metals and other contaminants) remains easy thanks to an industry-backed program called Call2Recycle that points people toward recyclers and retailers across the U.S. and Canada happy to take them off your hands at no cost. Here in The Bronx, we support Mayor Bill de Blasio in his efforts to achieve zero waste being shipped to landfills. The Bronx Council for Environmental Quality believes that everything can be recycled. Visit our Facebook page and offer your opinion. Thanks!